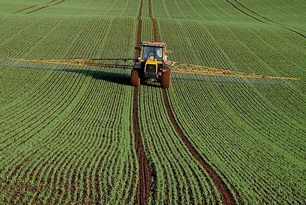 Bentazon (also known as bentazone) is an herbicide used on corn, cereal, pea, mint, rice, soy and succulent lima bean crops. It is mobile in soil (especially in areas with high rainfall levels), degrades slowly in the environment, and has been reported in surface, ground and drinking water. Despite its mobility, bentazon is not expected to arrive in drinking water at toxic levels. Bentazon is classified by the World Health Organization as being “slightly hazardous,” and quickly metabolizes into less hazardous substances when ingested. In animal studies, it has been shown to affect blood clotting and cause changes in the heart, liver, kidneys and prostate. Symptoms of exposure in animals include weight loss and gastrointestinal issues such as diarrhea and vomiting. Bentazon use has not been tested for toxicity in humans via the oral route of exposure. However, because bentazon is used as a water-based spray, emergency medical cases and clinical reports might be expected in the future from accidental ingestion by children or agricultural workers. According to Lenntech, activated carbon has a “very high probability” of adsorbing bentazon.